There are so many of our favorite people reading at this thing tonight, I’m even willing to forgive the use of Papyrus on the flyer. If you’re in or around Detroit, you’re not going to want to miss this. 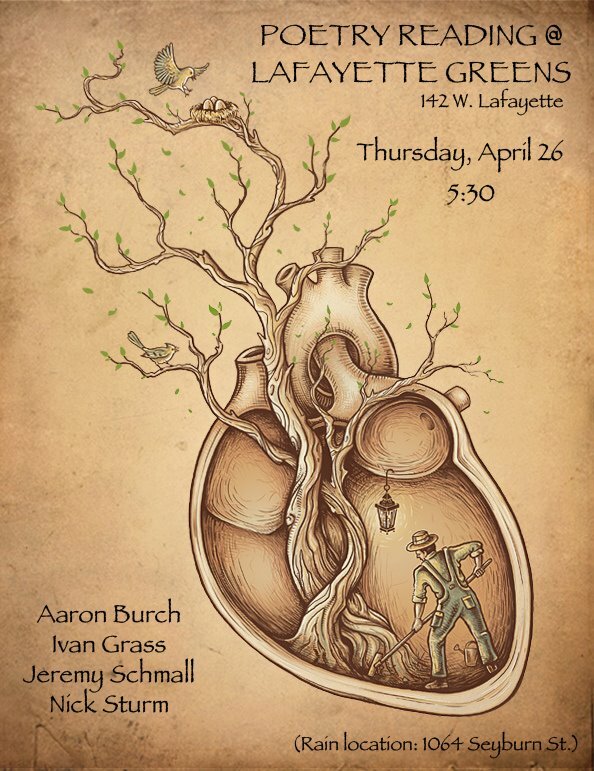 Come enjoy readings of poetry and prose in the beautiful Lafayette Greens garden (142 W. Lafayette) in the heart of downtown Detroit on April 26th (a Thursday) at 5:30. The readings will be fun and “edgy,” and quite possibly followed by coney dogs from Lafeyette Coney Island next door (if that’s your thing). Readers include Detroit authors Ivan Grass and Jeremy Schmall, as well as Aaron Burch (the author of HOW TO PREDICT THE WEATHER), and Nick Sturm (the author of WHAT A TIME WE’RE HAVING). Come and have a good ‘ole time with us! Note: The rain location for the event will be at 1064 Seyburn St., just off Lafayette near Indian Village. I’ve spent a lot of the past few days in the dirt. A chill and a wet has set into the air here that is on its way to record setting. When the clouds broke Saturday morning, the first true spot of sun Indy has had in almost a week, my arms went to work. 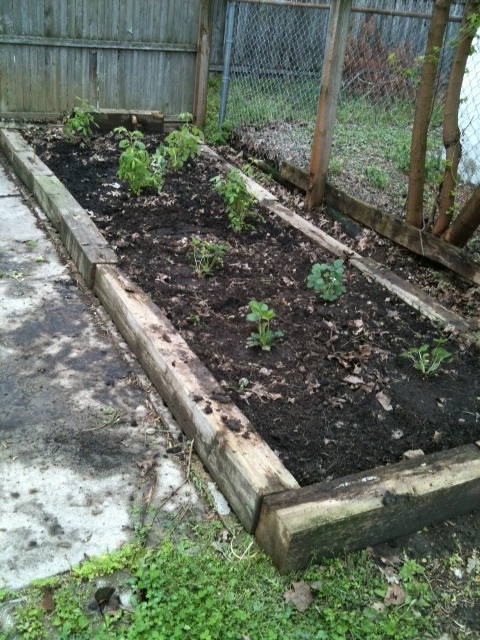 I took a couple friends up on their promise of leftover wood from some flowerbeds they’d torn out, and decided that wood would do well to become my own raised garden bed. I spent the better parts of Saturday and Sunday making trips to Lowes for topsoil, manure, and plants, and managed to get them all in the ground before the clouds moved in again Sunday afternoon. All the clouds and gardening got this story, “Overcast,” by Aaron Burch lodged in my brain. I’m pretty sure I vouched it months ago when it first posted at Booth, but who cares. It deserves it again for SSM. She had been gone only a week when she returned. It may have been longer. I brought something, she said. She walked in and through the house, and he followed. In the backyard, she held her hands out to him, together, palms up. Like holding them under running water, like cupping something delicate. The pose reminded him of a painting, though he couldn’t picture one specifically. He wondered if such an image existed and, if not, how one should. Inside her hands was a pile of plastic stars, the kind that stick to ceilings and glow at night. What we’ll do, she said, is plant them. Water them. Let them grow, like in a garden. And when they’ve blossomed, we can release them into the sky on cloud-filled nights. So, any night we want, we will be able to see a sky full of stars. Like it was all so simple. Read the whole story at Booth. This story also exists in Burch’s excellent collection of short stories, How To Predict the Weather.